JOHANNESBURG — The World Health Organization has decided that the latest outbreak of the deadly Ebola virus in Congo is not yet a global health emergency , causing frustration among some health experts. With multiple rebel groups active in the region, wary communities sometimes resisting health workers and a heavily traveled border nearby, the risk of regional spread is deemed "very high," WHO says. The outbreak region borders Uganda, Rwanda and South Sudan. A look at the outbreak with 1,220 confirmed and probable cases, including 772 deaths, since it was declared on Aug. 1. It has become the second-deadliest in history, behind the West African one from 2014-16 that killed more than 11,300 people. Ebola is a virus that can spread quickly and can be fatal in up to 90% of cases. The symptoms include fever, vomiting, diarrhea, muscle pain and at times internal and external bleeding. Symptoms can start to occur between two and 21 days from infection, according to WHO. The virus is most often spread by close contact with the bodily fluids of people exhibiting symptoms and with objects such as sheets that have been contaminated. Health care workers are often at risk of being infected, and burial practices that call for close contact with Ebola victims can spread the disease. Dozens of people in this outbreak have received one of several experimental Ebola treatments but their effect is yet to be fully studied. While there is no licensed treatment for Ebola, receiving early care such as rehydration and treatment of other symptoms helps to improve survival chances. A new experimental Ebola vaccine has been shown to be effective. Congo's health ministry on Friday said more than 98,000 people have been vaccinated. WHY IS THIS OUTBREAK UNIQUE? Health workers have called this the first Ebola outbreak to occur in what is essentially a war zone. Multiple rebel groups are active in Congo's northeast, killing hundreds of people in recent years. Attacks have led to a traumatized population that can be wary of outsiders. Some residents have been on edge because health workers are accompanied by armed guards from the U.N. peacekeeping mission or Congo's security forces. Many accuse the government of not protecting them from attacks. This is the first time an Ebola outbreak has occurred in this part of Congo, and health workers have battled misinformation as they explain the importance of safe burials and other preventative measures. One out of four people interviewed in eastern Congo a month after the outbreak began believed Ebola wasn't real, according to a study published in The Lancet Infectious Diseases journal last month. Some residents have rejected Ebola vaccinations and fled, or attacked health teams. Doctors Without Borders was forced to shut down two of its Ebola clinics earlier this year after attacks on clinics. That has hurt containment efforts, particularly the painstaking work of tracing contacts of infected people. Many new cases are still unconnected with known ones, a sign of the challenges that remain in a dense and highly mobile population. HOW LONG WILL THE OUTBREAK LAST? It's hard to say. Some health experts predicted months ago that the outbreak would end within six months' time. As complications keep appearing, the time frame is pushed back. "Given the average number of cases we're seeing now, this is not going to be over for at least another six months or more," Tariq Riebl with the International Rescue Committee said Friday. 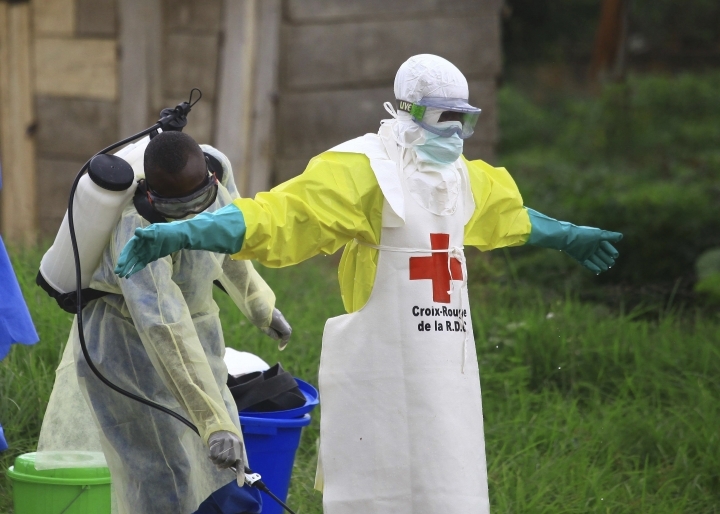 The chair of WHO's expert committee that unanimously decided the outbreak is not yet a global emergency, Robert Steffen, said experts were "moderately optimistic" the outbreak could be contained within a "foreseeable time."